We all are floating in a sea of stress. What few of us realize is that stress is tied to the habits our younger selves adopted to get along in the world. But we are not those habits. And we can learn how to first recognize, then free ourselves from our automatic behaviors and end our suffering. Drawing on the teachings of medical science and yoga, Dr. Todd A. Hoover charts a path to managing stress and experiencing true contentment. Chapter by chapter, he shows the way to overcome our mental limitations, accept and love ourselves, and conduct our lives from a place of true authenticity and freedom. This book is designed to bring together fundamental aspects of psychology, developmental neuroscience, social theory, and yoga science to reveal the causes and management of stressful events that occur in every human being. 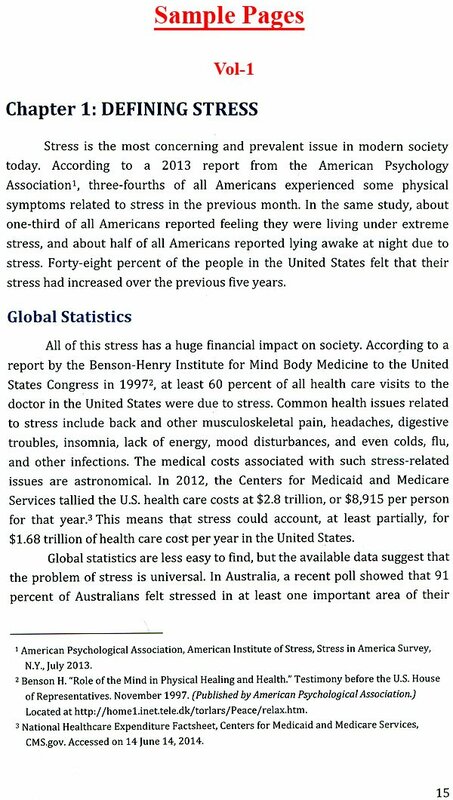 Stress tends to occur across a spectrum of severity, from the mild everyday stresses to those catastrophic events that make news headlines. An extensive discussion of the nature of stress, the neurodevelopmental underpinnings of human stress responses and potential strategies for enhancing stress adaptation are presented in a step-by-step format. This book has been organized into three sections within two volumes. Volume I is titled "The Binding of the Soul" and Volume II is titled "Ancient Tools for Modern Problems". 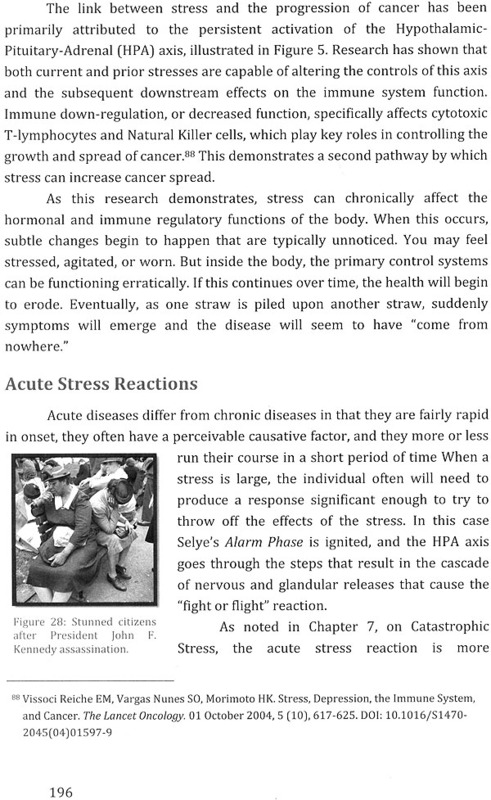 In Section I, you will learn critical aspects of the social and physiological causes of stress. To help reinforce this understanding, a basic overview of human psychosocial development is presented. The mechanisms of behavioral trait development and habit formation are explored in depth. Automatic behaviors form most of our reactions, but these automatic reactions are predominantly learned in early childhood. Understanding the mechanisms by which these patterns are acquired from our family and social peers is critical to helping us create the power to change our behaviors. This process of psychosocial development is further defined through the fundamental tenets of yoga philosophy regarding the Soul and the Gross Body. You will discover how the Soul or inner nature is progressively bound by learning and experience through the lifetime. 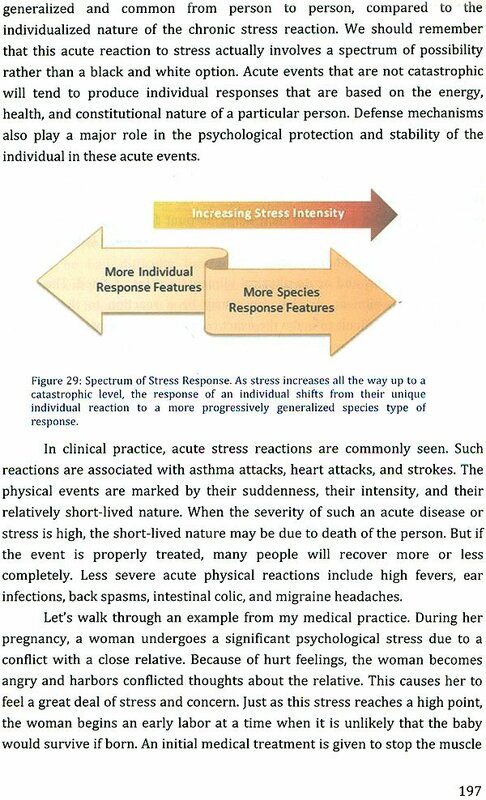 Finally, the information will help clarify the difference between human (species) types of common responses to stress and those responses that are more particular to an individual. Section II is the pivotal section of this text. 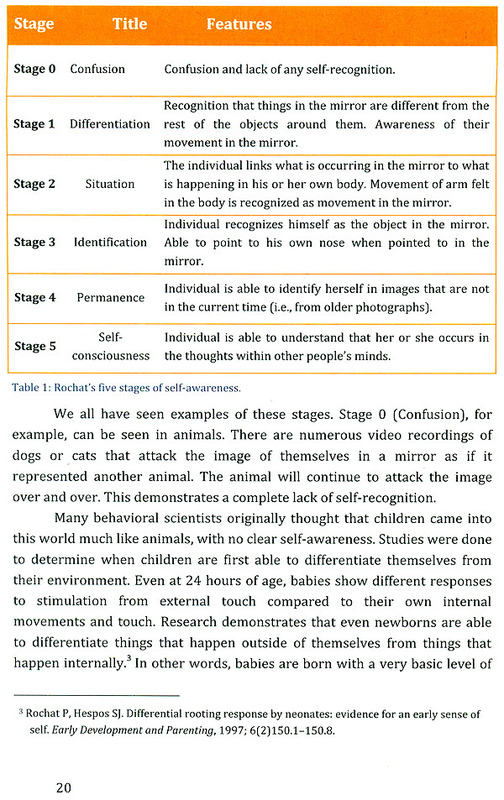 Self-awareness can help move an individual from automatically deploying unconscious patterns of reaction to developing an awareness of which reaction patterns are operating. Prior to the development of Self-awareness, individuals are at the mercy of their unconscious training and habits. As awareness increases, individuals acquire more power of choice. 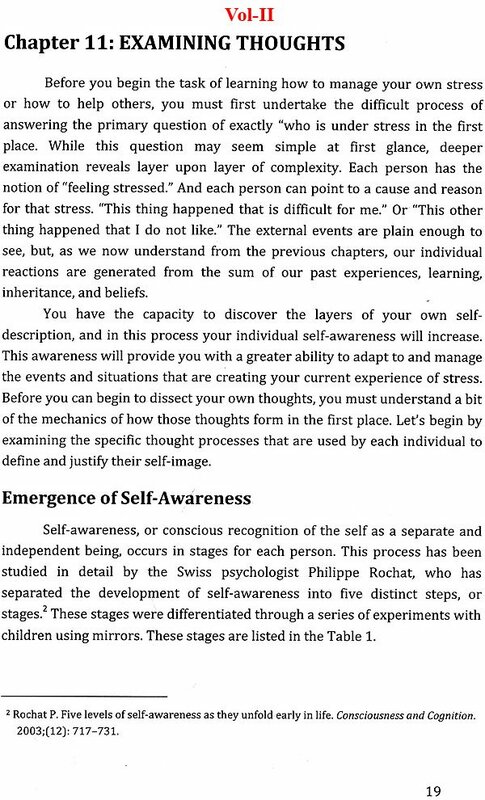 Self-awareness is the key to move from the Ego-identified self to the Soul-identified Self. This shift opens the door to liberation from stress. Section III presents a variety of stress-management techniques and strategies. 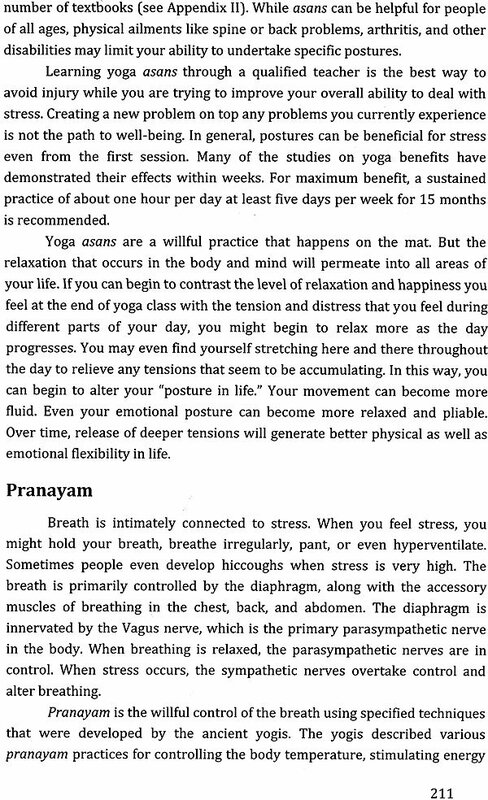 The goal here is to produce happiness and relative freedom from the negative effects of stress. While the strategies will be effective even without any significant self-awareness, they will become much more powerful for the individual who garners some insight into their being. Both conventional and yoga-based strategies for stress management are discussed. The goal of the practice of yoga is to liberate the individual from stress and to experience the ultimate state of awareness of the Self, or Soul. Choosing to move toward this goal of absolute freedom will help anyone reduce stress in their life even if they are never able to reach that final state of liberation. 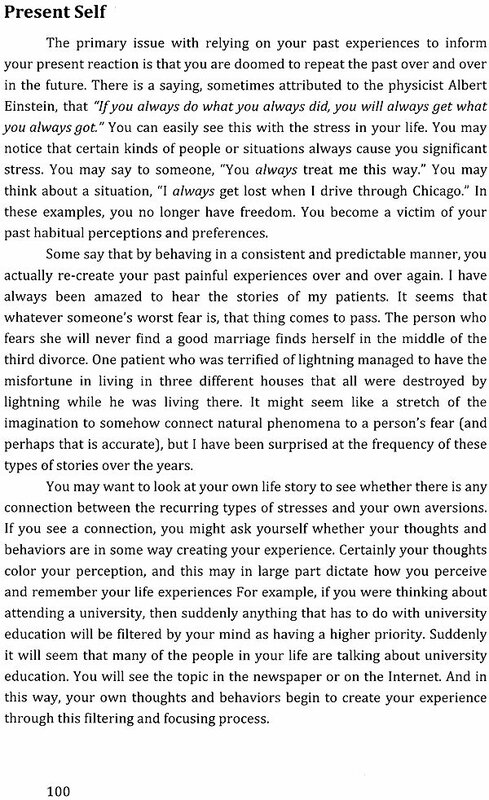 While it may be appealing to immediately jump to Section III of the text, I suggest you take the time to learn the practical underpinnings of how your body and mind have learned to adapt to stress, and how those habitual responses now automatically determine your daily response to any threat or trauma. This understanding will greatly increase your ability to utilize the tools presented in Section Ill, both in supporting yourself and others. Without taking these important steps, the techniques of stress management will remain hollow forms without true grit and substance. The content of this book reflects many of the personal and professional experiences of my life. As a medical director for a Fortune 50 company and as a family physician practicing integrative medicine for more than twenty years, I helped individual patients and also designed programs to help employees manage the stress associated with work. In my private practice I personalized the healthcare approach with each patient through a lengthy exploration of the various stressors in his or her life. In nearly every case I found a clear link between life stressors and disease development. Such repeated observations convince me of the critical importance of this subject for anyone interested in maintaining health and well-being. In addition to my solo integrative medical practice, I have practiced medicine in the U.S. Navy, the emergency room, and as a medical director for a Fortune 50 company. 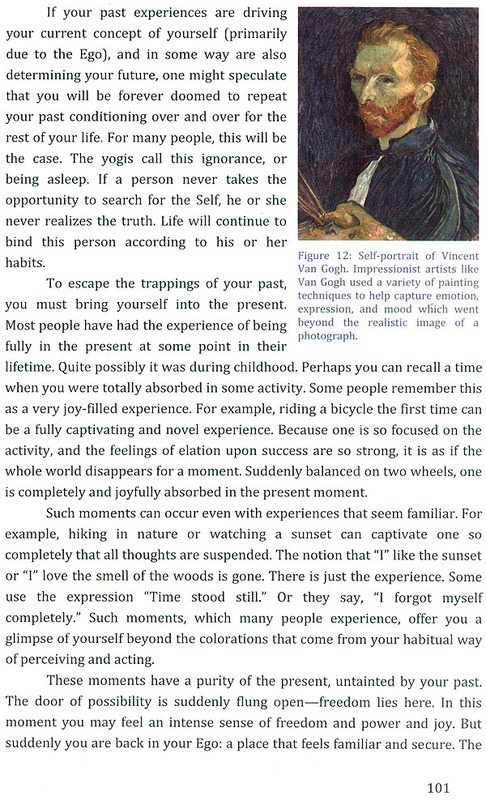 My training as a yoga teacher in 1989 was one step of many in my life practice of personal growth and the search for greater freedom from habitual and restrictive thinking. My commitment to community development has led to roles including President of the American Institute of Homeopathy, U.S. representative to the Liga Medicorum Homeopathica Internationalis, and trustee for the Homeopathic Pharmacopeia of the United States. 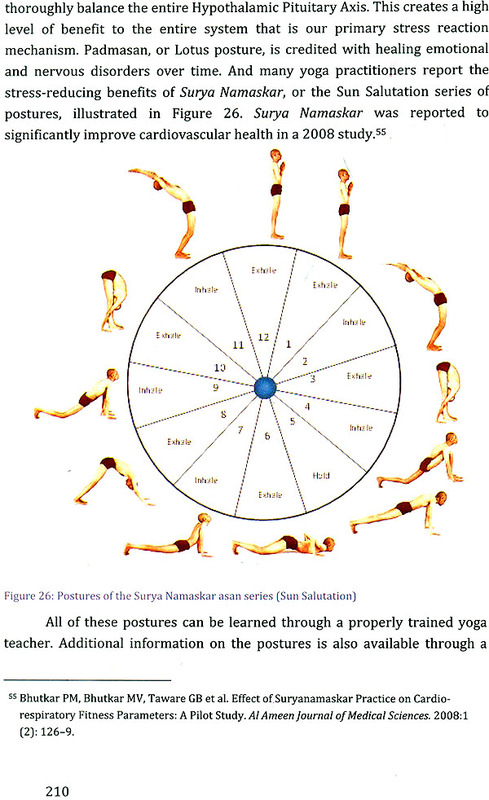 I retired from medical practice in 2014 to pursue additional yoga training at the Lakulish University in India. My greatest accomplishments to date include graduating Jefferson Medical College when I turned 23, living each day fully with my loving wife for the past 25 years, raising a powerful daughter, and developing a growing understanding of individual human suffering. These experiences have intermingled, melded, and inspired the content within. Please read and enjoy! Section I presents a comprehensive understanding of the stress response of the average human. 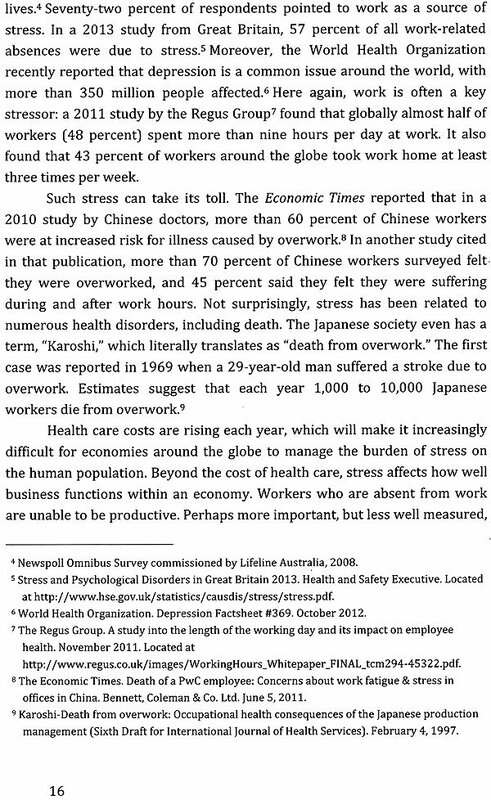 The nature and types of internal and external stressors are explored in depth. 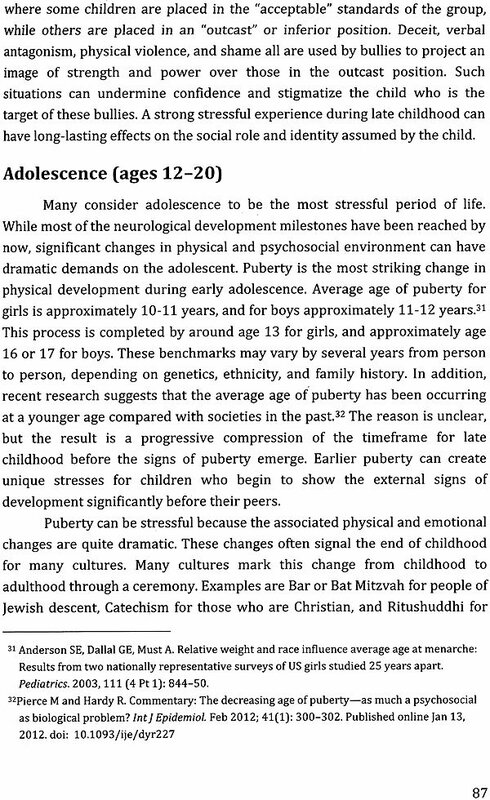 Human development, learning, acculturation, genetic inheritance, and direct experience all play a primary role in creating a complex array of potential responses to any stressful experience. Human beings are highly evolved organisms: just as our immune system has developed into a complex and adaptive defense against physical threats to our bodies, so too has our psyche developed complex and adaptive tools to defend against all types of stress. 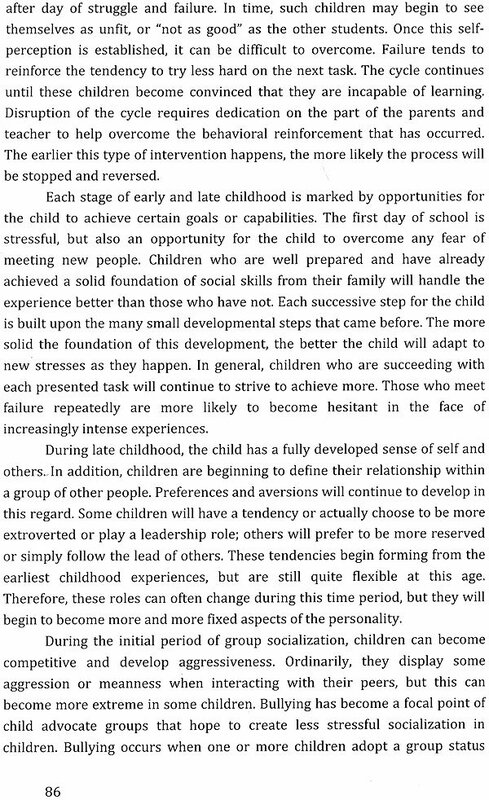 Later in this section I present an investigation of how childhood learning leads to habituation of behavior and ultimately formation of our character, which contains our primary stress-defense posture. Remaining introspective as you read will help you identify those characteristics and behaviors that may have become regimented or automated during your own developmental years. The process of character development helps to make our stress response very powerful and efficient, but may also cause us to cordon off different options for our learning and growth potential. Each of us has the opportunity to use our own life experiences to help test the validity of what we read. I encourage you to look carefully at your own experiences to determine what information resonates with you, as well as to see whether your experiences may be incomplete relative to the conceptual information presented here. Learning is an unfolding process. Some concepts are relatively obvious to the student immediately, while others gradually become clear as one's life continues to unfold. Personal growth and learning enable us to become more adaptive with relation to stress and are encouraged in everyone who reads this text. In the process of mastery, one moves from a state of ignorance, to learning, to experience, and finally to true understanding or knowledge. By adopting an attitude of experiential relearning, you have the potential to master the ability to manage any stress that occurs in your life. Such mastery is invaluable to your own health and well-being, and is essential for anyone who plans to help others with stress management. SELF - AWARENESS 14 .